PHOENIX — The Arizona Game and Fish Department is encouraging hunters who harvest a big game animal affixed with a GPS or VHF tracking collar to return that collar undamaged to any department office statewide. While harvesting a collared animal is legal, Game and Fish asks hunters to refrain from cutting, damaging or otherwise destroying any portion of a collar. A collar easily can be removed from a harvested animal’s neck by loosening two nuts on the black “drop-off” box on one side of the collar. A crescent wrench, socket wrench or multi-use tool can be used to loosen only those two nuts. The department relies on valuable data that collars provide in making science-based decisions that determine the most effective wildlife management practices. The stored data can include an animal’s behaviors, movement patterns and frequency, individual and group dynamics, home-range size and more. The technology is not inexpensive. A collar can range in cost up to several thousands of dollars. When factoring in additional costs of human resources, equipment and capture, the department is making a substantial investment in each collared animal. A portion of the funding comes from the Wildlife and Sport Fish Restoration (WSFR) program, a stalwart national funding source for state conservation and recreational opportunities. 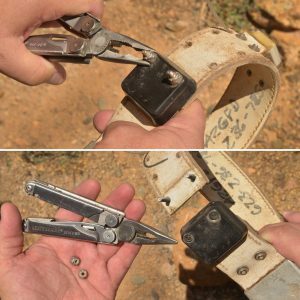 It’s also helpful for hunters to report the date and location of their harvest when returning an undamaged collar to any department office statewide. For more information, call (602) 942-3000.